What totally convinced me to pick Noteshelf as my go-to app for handwritten notes, though, is wrist protection. When people write, they usually rest their wrist on paper – that’s natural and necessary to have a correct writing position. Well gentlemen, unlike all the other apps available for iPad, Noteshelf has an option to not detect your wrist as an active touch on the screen. Welcome to natural and human writing on a tablet. As for features I’d like to see besides the upcoming Evernote and Dropbox integration and a template creator, it’d be nice to be able to pinch and zoom on pages, especially in landscape mode. I also don’t like the fact that you can’t select multiple pages when exporting them (email and iTunes are supported). 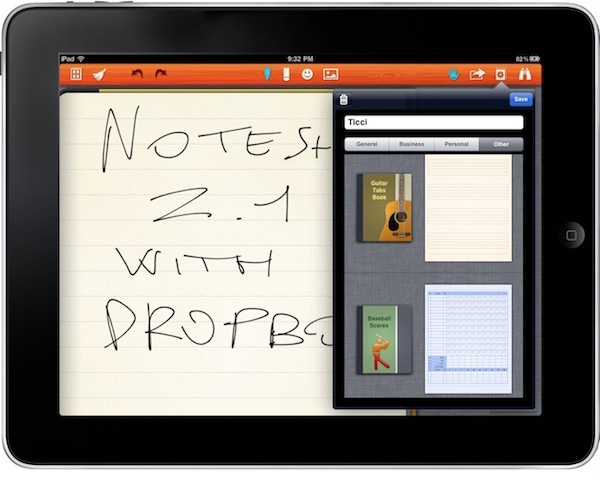 Noteshelf was already a great iPad app, now it's even better. With the latest 2.1 update available in iTunes now, the developers added the possibility to export notes as images pr .PDF documents to Evernote and Dropbox, a feature many users have been asking since the first version of the app. Uploading to these services is simple and accessible through a popover menu in the top toolbar. You can also select and export multiple pages via email, or just email a whole notebook. Speaking of which, there are new notebook themes such as music notes and baseball scores. The wrist protection functionality has been enhanced as well, with a slider that allows you to manually adjust the zone you don't want your hand to write on. The developer of the app promises further wrist protection, zoom and images fixes are coming with the next updates. 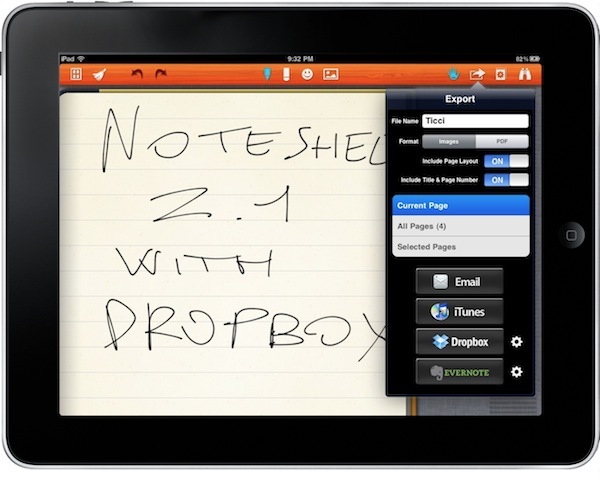 Noteshelf deserves your attention, and works perfectly with the Pogo Sketch. Available at $4.99 in the App Store.